Royal Wings, a subsidiary of Royal Jordanian Airline, will start operating direct regular flights between Aqaba and Beirut, Lebanon, twice weekly from February 24. This new non-stop service between Aqaba and Beirut is part of Royal Wings' effort, in cooperation with the Aqaba Special Economic Zone Authority (ASEZA), to strengthen the position of the Gulf of Aqaba on the regional and international tourism map. It also seeks to improve the tourism product in Aqaba, in terms of service and cost, especially after the recent government decision to exempt charter and regular airlines operating in Aqaba from taxes and fees. The direct flights will enable Lebanese tourists to enjoy the Red Sea shores, in addition to increasing tourism to Wadi Rum, Petra, the Dead Sea and the Baptism site. The direct flights will save Lebanese tourists time and cost, in terms of not needing to transit via Amman’s Queen Alia International Airport (QAIA). The flights, with convenient time schedules and reasonable rates, will also enable Jordanian tourists, students and businessmen to visit Beirut. Jordanians have long been considered among key tourists in the Lebanese tourism market. Royal Wings will operate the flights on the Airbus A320 aircraft every Friday and Tuesday. Flights will depart from King Hussein International Airport, Aqaba, every Friday at 12:20 and arrive to Beirut Rafic Hariri International Airport at 14:00. The flight will then depart Beirut at 14:45, arriving in Aqaba at 16:15. On Tuesdays, the flight is scheduled to depart from Aqaba at 6:00 and arrive Beirut at 7:45. The return flight will depart Beirut at 8:30 am and arrive in Aqaba at 10:10. The ticket price for one way is JD76 ($106.8), while the roundtrip ticket price will be JD150 ($210.7), inclusive of all applicable taxes. 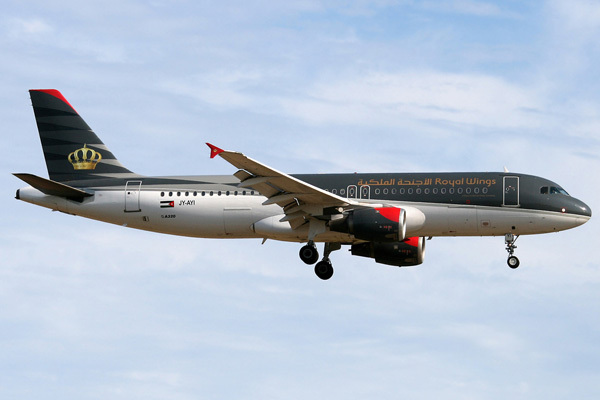 Additionally, Royal Wings operates two regular weekly flights between Amman and Aqaba on Fridays and Tuesdays, besides Royal Jordanian’s regular flights on this route. On Friday, Royal Wings flight will depart from Queen Alia International Airport at 10:45, arriving King Hussein International Airport at 11:40. The return from Aqaba will be on Tuesday at midnight, arriving to Amman at 01;00 on Wednesday .The one way ticket price will be JD20 ($28), while the round trip price will be JD34 ($47.7), inclusive all taxes.